Welcome to Nutfield Conservation Society - here you will find the latest news and details of local campaigns that affect the Nutfield area. 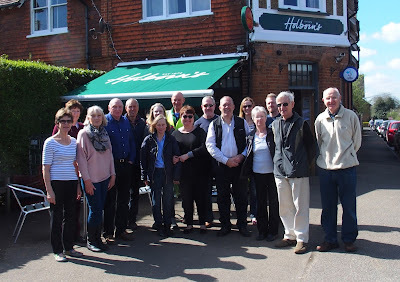 Thanks to volunteers for another successful Village Litter-pick. We were pleased to receive the support of additional helpers this year which enabled more areas of the village to be included in the schedule. Thanks to Tandridge Council for providing additional picking equipment and removing the litter pile afterwards and appreciation to Nutfield Parish Council for extending their insurance cover for this community event. The weather was particularly kind to us this year and over 60 bags of litter was collected, together with a large pile of used tyres dumped in roadside areas (obviously as a result of the change in recycling policy involving a charge being made for such items). It was pleasing to see those of you pictured above able to gather outside Holborn’s and participate in Dean’s kind hospitality after the event ended on the Sunday lunchtime. Many thanks to Committee Member Paul Beard for organising this event again which hopefully helps us all to focus on the importance of maintaining a Parish Litter-Free zone. © Nutfield Conversation Society 2012. All Rights Reserved. Simple theme. Powered by Blogger.